Produktinformationen "18s 21NTLW5000 8 Ohm"
The 21NTLW5000 is a 21 inch diameter next generation high performance subwoofer, specifically designed for high SPL very low frequency applications in either a reflex, bandpass or horn loaded configuration. For optimum results we recommend the usage of power amplifiers able to deliver 4000W program power without clipping. 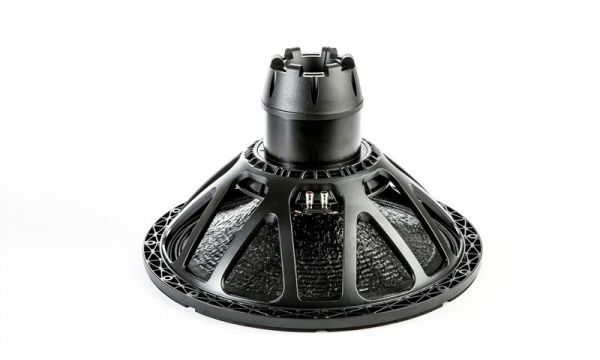 The 21NTLW5000 uses Eighteen Sound proprietary Tetracoil technology, where two different, axially separated magnetic gaps and two inside-outside 4.5" diameter aluminum voice coils are wound on the same former and suspended evenly in the two magnetic gaps. 3) the equivalent voice coil diameter of a 4.6" Tetracoil speaker is greater than 6". Consequently heat dissipation occurs over a larger surface area, driving AES power handling up to 1800 W.
21NTLW5000 design features include a large displacement suspension system which, in conjunction with a fiberglass reinforced, straight ribbed cone allows an ultra-linear piston action and provides full mechanical control across the entire working range. 21NTLW5000 is able to perform properly under inclement weather conditions: the exclusive cone treatment improves pulp strength and gives water repellent properties to both sides of the membrane. In addition, magnetic structure metal plates coating is far more resistant than standard zinc coating to the corrosive effects of salts and oxidization. Weiterführende Links zu "18s 21NTLW5000 8 Ohm"
Kundenbewertungen für "18s 21NTLW5000 8 Ohm"